Perhaps no team in the state enters district play as a bigger favorite to win a state title than the Bishop Miege Stags. Miege has rolled to a 6-0 start in the Eastern Kansas League, of the best leagues in the state. The Stags’ closest game came in a 17-point win over St. Thomas Aquinas. Miege is led by quarterback Ryan Willis who has thrown for nearly 1,600 yards and 20 touchdowns this season. As dominant as the Stags have been, there are other legitimate contenders. The Hays Indians also have moved down from 5A and also have one of the top quarterback in the state in Alex Delton. The Indians have scored a lot of points this season, and needed them in last week’s 64-50 win over Dodge City. Other unbeaten in Class 4A, Division I include a pair of surprising teams in Abilene and Atchison. The Abilene Cowboys have gone unbeaten in the North Central Kansas League, but were tested in wins over Concorida (14-7) and Wamego (25-14). Atchison’s unbeaten mark has come in the Kansas City-Atchison League where the Redmen have won four games by 11 points or less. While the unbeaten are dwindling, there are still strong contenders with 5-1 marks in 4A-I. Topeka Hayden’s only loss is to unbeaten Manhattan, while defending-champion Buhler has only dropped a Week 1 game to 4A-II No.1 Andale. Atchison (6-0) – Atchison is a perfect 6-0 on the season after avoiding the upset bid from KC Wyandotte (1-5) with a 15-12 win. Junior running back Wykeen Gill leads the Redmen rushing attack with 511 yards and 10 touchdowns. The Redmen also won one other nail-biter during the regular season over KC Washington, 27-26. Basehor-Linwood (5-1) – Former Lyndon coach Rod Stallbaumer’s Bobcats enter district play with a 5-1 record following 48-7 blowout win over Bishop Ward. Basehor Linwood has three players with over 50 rushing attempts on the season, who have combined for 11 touchdowns. They’ve had two wins of three points or less, a 20-17 overtime win over Baldwin (4-2) to open up the season and a 9-7 win over Eudora (3-3). KC Piper (5-1) – KC Piper’s only loss on the season came on a 31-24 overtime loss to Bonner Springs (5-1). The Pirate’s rushing attack has gained 1,234 yards and 19 touchdowns. Senior quarterback Ty Banes leads the way for the Pirates with 536 yards passing with seven touchdowns and 272 yards rushing and five more scores. Tonganoxie (1-5) – The Chieftains look to be at the bottom of district 1, entering with a 1-5 record. Tonganoxie struggles to put points on the board failing to score 20 points in every game besides one. Senior quarterback Carl Hecht has thrown for 718 yards and four touchdowns on the season. Bishop Miege (6-0) – Ranked No. 1 in the state, the Stags are 6-0 in an Eastern Kansas League filled with Class 6A and 5A schools. The Bishop Miege offense is led by quarterback Ryan Willis, who verbally committed with the Kansas Jayhawks before the season. Willis has passed for nearly 1,600 yards and 20 touchdowns. Dawson Downing has been exceptional in rushing for 1,209 yards and 16 touchdowns. KC Sumner Academy (2-4) – The Sabres enter district play on a three-game losing streak. KC Sumner will try to make the playoffs for the first time since 2010. Louisburg (2-4) – The Wildcats opened the season with wins over Ottawa and Eudora, but they have dropped four straight to KC Piper, Baldwin, Paola and De Soto. The losses to Baldwin and De Soto were both by one point. Louisburg was within a touchdown to Paola. Spring Hill (2-4) – The Broncos have earned overtime victories against Paola and De Soto, but fell to Fort Scott, Ottawa, Baldwin and Eudora. Spring Hill won its Class 4A district a year ago and advanced to the second round of the playoffs. Key Games: (Wk 9) Frontier League teams Spring Hill and Louisburg will meet in a game that could decide who advances to the playoffs. Baldwin (4-2) – Baldwin enters district play riding a four game winning streak following a 20-14 double overtime thriller against Paola (4-2). The Bulldogs have had to battle what seems like every week to get a win. Four of its six games for Baldwin has won or lost by seven points or less. Ottawa (4-2) – When the Cyclones score they usually come away with a win. Ottawa scored over 40 points per game during its three game winning streak from week 3-week 5, including a 44-43 thrilling victory over Spring Hill (2-4) in week 4. De Soto (3-3) – De Soto has been up and down all season. The Wildcats put up a 70 spot in week 1, but then failed to score in its next two games. They enter district play coming off a 13-12 win over Louisburg. Eudora (3-3) – The Cardinals have created a trend for themselves during the 2014 season. When Eudora scores double digit points, they win. When they don’t, they lose. The enter district play on a high note after a 32-14 victory over Spring Hill (2-4) last Friday night. The Cardinals lost quarterback Grant Elston to an injury in a Week 2 game against Louisburg. Key Games: All games are crucial in a wide open district, but (Wk 9) Baldwin at Eudora may decide both spots. Fort Scott (5-1) – The Tigers’ only loss is to Pittsburg, which is undefeated and ranked No. 2 in Class 5A. Fort Scott has rolled in its past three games and boasts a win over Frontier League foe Spring Hill. The Fort Scott defense has allowed 14 points or fewer in four games. Paola (4-2) – Both of the Panthers’ losses came in overtime, falling to Spring Hill and Baldwin. Paola also boasts a pair of 20-14 wins over Louisburg and Ottawa. Mike Dumpert’s Panthers finished 11-2 a year ago, but opened the season with only three returning starters on each side of the ball. Chanute (3-3) – The Blue Comets opened the season 0-2 with losses to nonconference foes Columbus (6-0) and Bonner Springs (5-1). However, Chanute has won three of its past four games. In his second year as Chanute’s head coach, Jason Feeback looks to get the Blue Comets back in the playoffs after an 8-3 season a year ago. Quarterback Kenton Richards leads a wide-open offense and can be a dual-threat. Backs Ethin VanAnne and Alex Son have big-play capability, and Derek Sharp and Colton Erikson has proved to be a steady receivers. Labette County (2-4) – The Grizzlies have appeared to make vast improvement since last season. Labette County earned wins over Paola and Iola, but also played within two points of last year’s 4A runner-up Coffeyville. Independence (3-3) – The Bulldogs have dropped their past two games to Chanute and Fort Scott. Independence’s most notable win of the season is against Class 3A’s Caney Valley. Its other two victories came against 2-4 Labette County and winless Parsons. Augusta (2-4) – The Orioles are coming off a heartbreaking 27-26 overtime loss to Rose Hill. Augusta has already matched its win total from last season as it returned eight starters on offense and 10 on defense from a 2-7 team. Jason Filbeck is in his first season as the Augusta head coach. Senior quarterback Dustyn McEachern has passed for 1,027 yards and 12 scores for the Orioles. Coffeyville (2-4) – The 4A runner-up last season, the Golden Tornado has struggled in 2014. Coffeyville’s only wins are against winless Parsons and 2-4 Labette County. The win against Labette County was by only two points. Senior LaDarrius Johnson has rushed for 1,067 yards and seven touchdowns, while averaging 9.0 yards per carry. Winfield (2-4) – A playoff team a year ago, the Vikings began the season with only 12 returning lettermen. Winfield has earned close wins over Rose Hill and El Dorado. Winfield is attempting to make its third straight trip to the postseason. Key Games: In an even district, every game will be meaningful. Topeka Hayden (5-1) – Hayden enters its district play as the clear favorite to win. Hayden’s only slip up came in week 3, a 23-20 loss to class 6A No. 5 Manhattan (6-0). The Wildcats are averaging 41.3 points per game and are allowing just 9.2 points per game. Hayden should cruise through district play and prepare to make a deep run in the playoffs. Andover Central (3-3) – Andover Central should feel comfortable making the playoffs with games against Towanda-Circle and El Dorado. Junior running back Jordan Birch has eight of the nine-team rushing touchdowns and 650 of the 879 total rushing yards. El Dorado (1-5) – El Dorado is coming off a 60-7 loss to class 4A-I No. 4 Buhler. The Wildcats drew a tough district with Topeka Hayden and Andover Central being the favorites to advance to the playoffs but with a district opening game against winless Towanda-Circle could make the Andover-Central matchup in the last week of the season a win-or-go-home game for both teams. Towanda-Circle (0-6) – The Thunderbirds have only scored a total of 52 points this season, 32 of them coming in a week 3 loss to Wellington. The Thunderbirds have a tough hill to climb with games against Hayden, Andover Central, and El Dorado to end the season. Key Games: (Wk 7) Andover Central at Topeka Hayden will decide both playoff spots. Ulysses (4-2) – Ulysses junior running back Ian Rudzik is one of Kansas’ best players. Rudzik has put up big numbers three straight seasons and has 95 carries for 1,269 yards and 14 scores this season. Senior Tregg Rodriguez has missed most of the season with a knee injury, but should return soon. Ulysses has lost in overtime to Holcomb, 17-14, and fell 14-7 to Scott City last week. Wellington (4-2) – The Crusaders started out 4-0, but lost 63-21 to Andale two weeks ago, and 38-34 to Collegiate last Friday. Wellington has not won more than five games since a 6-4 mark in 2009. Mulvane (2-4) – Mulvane opened 2-4 with a 17-15 loss to El Dorado in Week 1, and a 34-6 loss to Buhler in Week 2. They won 31-13 against Clearwater in Week 3, and 48-6 at Circle in Week 5. Rose Hill (2-4) – Rose Hill has two losses by a combined four points, a 16-13 defeat to Winfield in Week 2, and an 8-7 loss to McPherson in Week 4. However, the Rockets beat Augusta, 27-26, last Friday. Rose Hill has a 5/9 TD/INT ratio. Abilene (6-0) – The Cowboys have equaled its win total from last year after ending last season 6-5. Two shutout wins to start the season set the tone for a perfect 6-0 record entering district play. It is vital that Abilene starts its district play with a win against McPherson (4-2). Hays (6-0) – Ranked No. 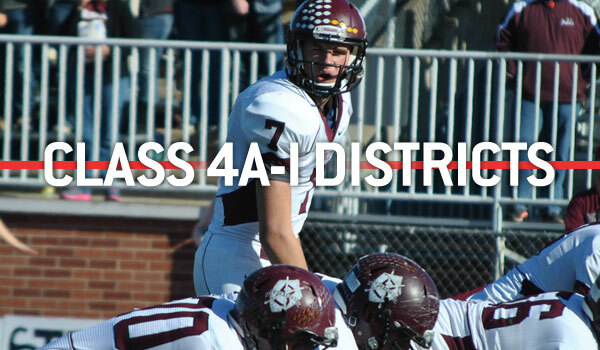 2 in the state, the Hays Indians are the favorite to win district 8. In the last five weeks, Hays has put up 42 points or more, including 64 points last week in a shootout win over Dodge City (4-2). Quarterback Alex Delton has carried the Indian offense with huge numbers both rushing and passing. Buhler (5-1) – Defending champion Buhler enters district play ranked No. 4 in 4A-I and the Crusaders are coming off an easy 60-7 win over El Dorado (1-5). The Crusaders dropped their first game of the season to class 4A-II No. 1 Andale, 41-20. Buhler has scored 48 points or more four times in six chances this season. Junior quarterback Jace Williams and classmate Dillon Engelland have put up big numbers for the Buhler offense. McPherson (4-2) – The Bullpups ride a four game winning streak into district play following a 40-0 shutout win over Winfield. McPherson dropped its first two games of the season to class 5A No. 3 Salina South and class 4A-II No. 1 Andale. Quarterback Kyler Kinnamon is a dual-threat that leads the Bullpup offense. Key Games: Undoubtedly the toughest district in class 4A-I. The teams are a combined 21-3 on the season, two are ranked, and another receiving votes. It should be interesting to see what two teams come out of this district.